As far as health and beauty treatments are concerned, very few impress me to a state of repeated recommendation. Dina Gohil‘s ‘Medical Pedicure‘ is one of the chosen few. Nestled in a private practice on South Moulton Street (just off of Oxford Street), ‘DG Podiatrist’ is her eponymous specialist’s indisputable lovechild. From the second I went in for my appointment, Dina met me with an unshakeable passion and knowledge that took me from podiatry noob to, well, less of a podiatry noob (with perfect feet!) in only 45 minutes. During the treatment, Dina takes the time to really understand your current state of health (all connected to your feet, I’ll have you know!) and combines podiatry, chiropody, and luxuriously healthy spa therapies to help you put your best foot forward. I’ve worn the Lavera Eyeshadow Base every time I’ve had to wear make-up this month and I am a complete convert. The organic and vegan gel formulation is both dermatologist & ophthalmologist tested and gives your eyeshadow all-day staying power. Offering the same creaseless, pigmented results as the chemical-filled primers loved by everyone and their mothers, I’ve thrown all other primers away. I am newly obsessed with the natural beauty brand in its entirety but two particular products knock many of my other ‘green beauty’ favourites out of the park. The first – Thesis’ Makeup Remover in Rosemary Citrus – removes heavy makeup with just a few swipes and hydrates skin as it cleanses. I have kept it by my bed for weeks and find it to be the best (and healthiest) product I have ever tried for lazy nighttime cleansing. When I double-cleanse, however, I follow the Makeup Remover it with the Thesis Facial Cleanser in Tender as Petals. The powder formulation is 100% natural (therefore ideal for all skin types) but took me a week or so to fall in love with. Essentially, you mix the powder with a tiny bit of water in your hands to create a cleansing paste. It’s not very intuitive, but once you find the best way to do so (mine is a shower routine: I tap a little bit of powder into wet palms, pat that into my cheeks, and add more water as necessary to ‘wash’) you are left with the softest, cleanest skin imaginable. 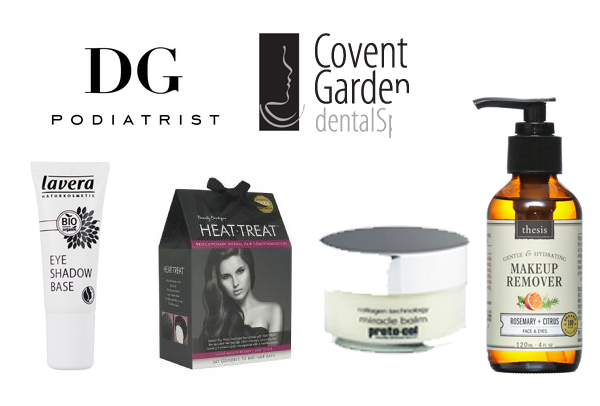 Beauty deal of the month goes to the Sparkling Smile package from the fantastic Covent Garden Dental Spa. For £99, you receive their Deluxe Diamond Sparkle Stain Removal Clean (including air-flow) and then jet around the corner to Station Spa for a luxurious Dermalogica Microzone facial (a £170 value). With both practices filled with the most lovely and talented staff, I could not think of a better way to feel fresh for the new year. I am an unfortunate combination of 1) incredibly slow healer and 2) clumsiest human alive. Looking for something that would keep a leg full of scratches from scarring after a particularly ruckus hike, I stumbled across proto-col’s miracle balm and haven’t turned back since. The tiny treatment tub uses the hydrating, anti-inflammatory and anti-bacterial benefits of Collagen, hyaluronic acid and beeswax to aid everything from burns to stings. A medical cabinet must. In the never-ending pursuit of silky strands (#bleachproblems), I recently trialled Heat-Treat‘s reusable thermal hair conditioning cap and couldn’t finish this month’s ‘beauty favourites’ without it. The microwavable cap creates a salon-steam environment for any hair treatment you want to apply (though it comes with three fantastic samples), allowing any active ingredients to penetrate the hair shaft as deep as possible. The result? Intensely shiny, healthy hair in five minutes max.